The library is open to all members of the Academy community. Borrowers may check out books for three weeks and DVDs for one week. Each borrower may have three DVDs out at once; automated emails act as reminders to return or renew materials. Southern CT State University - M.S. Old Dominion University - M.A. Virginia Wesleyan University - B.A. Mount Holyoke College, B.A. English; Hofstra U. School of Law, J.D. 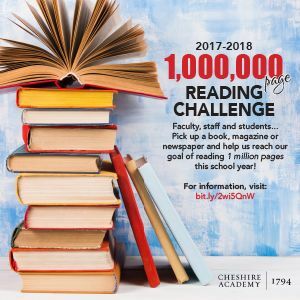 Cheshire Academy students, faculty, and staff please help the Library reach its goal of reading one million pages by May, 2018. Use this form to track your progress. Total Pages Read So Far!